Reject unlisted domain is one of many method to improve anti spam on email server, especially Zimbra mail server. On Zimbra, we can setup any IP address to listed as trusted network. IP address listed on trusted network, can sending email without authentication or prompt asking. In other words, listed ip address on trusted network can sending email with any domain, although is not listed on Zimbra. I want to restrict users can only send mail to local domain,can I set the server like this? I have restricted user send mail to local domains. Server error: ‘554 5.7.1 : Sender address rejected: Sorry, you are not authorized to sending email’, what is this error? how can the sender may receive the error? It is possible to lock a compromised account as spam, automatically? It could be handled by COS or preferences in every users. Thanks a lot for the tutorial. Very usefull. I get an error by executing the following command. What Zimbra version that use? this guidance for Zimbra 8.5 and newer. helo, i have successully block the other domain but after several days, all blocked domain regain their access.. none of the setting is changing in cbopolicyd, how is this possible? Please change default port SSH from 22 to other port. Example 2254. Hello, is it possible to import automaticly all domain i configur in Zymbra as member of “list_domain” Policy groups? 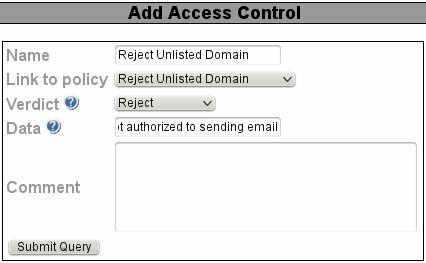 Using the article I had implemented the policy but it has stopped sending mails among the users of the server within the server domain. What the log info you are getting when try this configuration? are you has been added your domain to list_domain? Had implemented rate limit policy prior to this. Had defined my domain there in list_domain. Hence used the same variable here. I had placed ! in front of group while configuring policies. However, I had got it through by enabling “default inbound” and “default internal” policies using groups “internal_ips” and “internal_domains” which I had disabled earlier. Is it OK doing this. I think the problem that sender ask read receipt after he sending email to you. Many thanks for your articles you made on your blog. They helped me a lot to improve the security of my Zimbra servers. But I need help to fix my problem with this policyd settings in this article. The setting works as escpected but the out-of-office messages stopped. If I disable this then it works. com.zimbra.cs.mailclient.smtp.InvalidRecipientException: RCPT failed: Invalid recipient other@otherdomain.com: 554 5.7.1 : Sender address rejected: Sorry, you are not authorized to sending email. I don’t understand why Zimbra wants to identify the sender as Other user and not Zimbra user. That was I excepted to happen, but it is not happening. I use the latest Zimbra 8.7 OSE. Do you need more info from log file? Maybe I misunderstood your answer. So is there any way to make exceptions for out-of-office messages in policyd settings? Yes, I disabled it. I really like this restriction but I won’t using it as I hosting ~30 domains and few hundreds of accounts on this server. Great how-to to secure zimbra servers ! How can I correct for this issue? Thanks for the update! I guess we have to make some decisions on whether block the spam or allow the features the users requested. 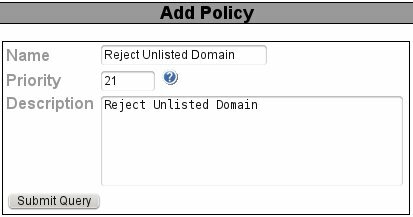 After some tests I found a solution, in the Policy Group add a new entry in the list_domain group and add the ip of your server in the example X.X.X.12/32. With this new entry you will be able to confirm the read receipt request. Greetings, I have the following query, is it possible to use a tool such as cbpolicyd to reject Zimbra SPAM attacks? Hi Iman, when i select as “Virdict” filter, what type of filter can i do? Where can i find a manual for filer syntax? In the “list_domain” member should I add all the domains I want to release? Is not there a way for it to automatically know which domains are listed in Zimbra, and block everything that is not listed? Please, Is it possible to block email where return-path in header does not match from address? We get a lot of email with return-path = spam account but From = internal email address and it confuses some of our users and they end up opening spam viruses. If possible to block by policyd, please explain how. Thanks, I already have that configured. But my issue is the spammer is not relaying or authenticating via my server. Its spam from account outside my server eg spam@gmail.com, but the from address is configured as user@myserver.com, when it gets to mailbox unless you view orginal email, the spam address is not visible. Zimbra Server Going to spam folder yahoo gmail and when I Check my spf and dkim dmarc PASS in gmail yahoo but still going spam can you give solution this and You need other information.